Back in the day, a guaranteed smile-inducing comment was for someone to describe my style as "trendy." I interpreted that as being fun, fearless, and fashion-forward. (Who knows what the person actually meant by "trendy." LOL) Now, it's an awesome part of my job to know what's "on-trend." Yet, merely being "trendy" is not enough to ensure that I will wear a garment. It took me quite awhile to jump on the peplum bandwagon. 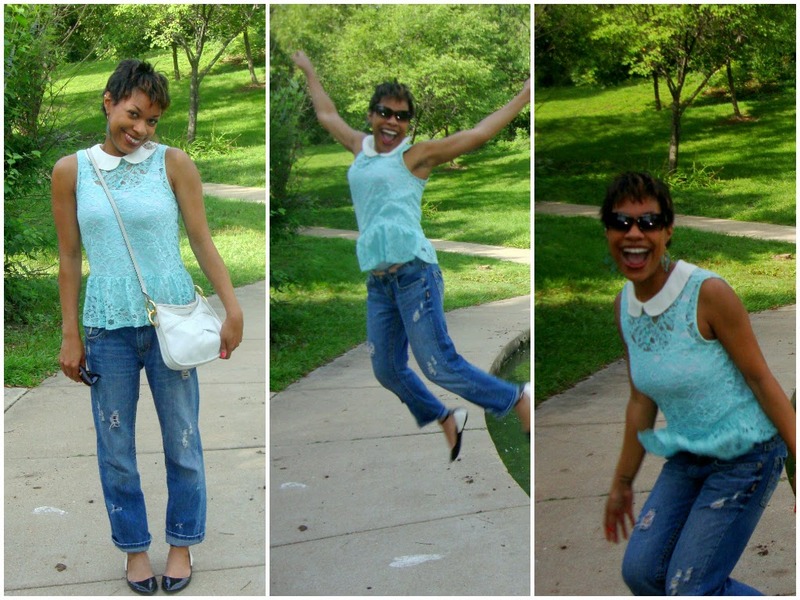 (About a year ago, I did attempt to sew a retro peplum blouse. The result was so disastrous that it kinda scared me away from peplum for awhile.) Now that I found a cute lace peplum top, I'm not sure what took me so long! The peplum silhouette, with a cinched-in waist and short, skirt-like fabric around the hips, was popular in the 1980s. It popped up again on the Spring 2011 runways, and quickly found its way into every "trendy" (and not-so-trendy) store. Peplum now happily resides in my closet. And for the record, I still take "trendy" as a style compliment. I love how it's like you're wearing a mini, mini-dress.